In this day of manufactured goods, we don't think that items have histories but the last few blog posts on 52 Ancestors cover things instead of people. The stories of these things help me understand the times my ancestors lived in and appreciate the items they had and the stories behind them. The basket in the picture above always hung at the farm of my Aunt Dodie and Uncle Sam Henry in the back kitchen of their farmhouse. I remember it holding rags and towels that were used for all sorts of things around the house and garden. At some point, she must have brought it into town when they moved to Oak River and it hung in their garage. After she passed away in 2010, my Dad brought it to his home and told me the story that went with it. 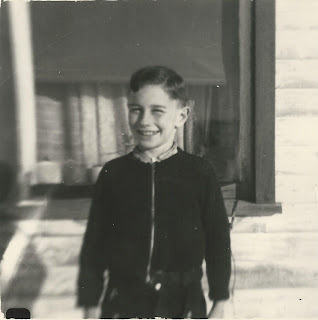 He thinks he may have been 8 or 10 years old which would be in the early 1940's. His father Alex died in 1941 and this must have been a sad and stressful time for the Simms family; five children and Mary (Sinclair) Simms. Dad recalls Aboriginal people often went by their house in wagons full of adults and children with their dogs following along. He remembers their own dog Skipper barking like mad at the strangers coming up the lane. 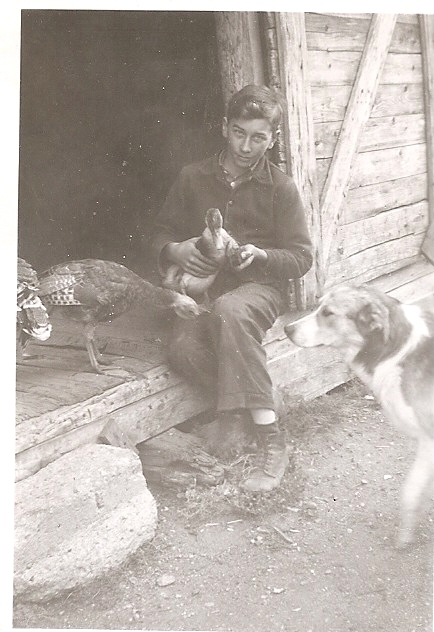 Dad holding a duck in the doorway of the "summer kitchen". Skipper and a turkey in a staring match! His mother would never let them go without giving them something to eat and she did that day, perhaps some homemade bread, or biscuits and some meat from her meagre supply. They went away happy but Dad recalls them returning to the house a short time later with the basket, which they made using the willows between the Simms quarter section and the next. The basket currently hangs in his shop in the barn and it holds much more than rags now - a fantastic story!